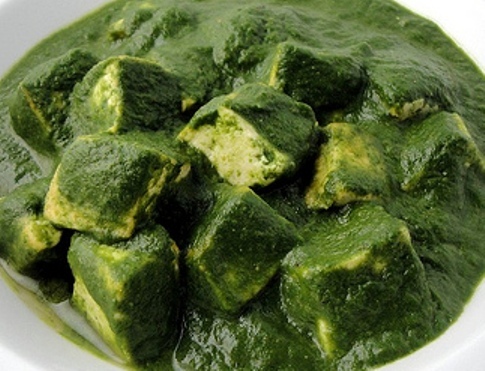 Traditionally, Palak Paneer is made in Indian homes using a soft homemade cheese. But we’ve got our own vegan spin on the much loved vegetarian favourite. We recommend using tofu instead of the cottage cheese if you’re vegan or lactose intolerant, or simply watching your waistline. Add the washed spinach leaves to a pot of boiling hot water. Let it rest for one minute and drain all the water through a colander and hold under cold tap water for a minute. Puree the spinach to a smooth paste in a blender. Keep aside until needed. Heat the olive oil in a pan on medium flame and fry the tofu pieces till they turn golden. Flip them over and cook the other side for another minute. Keep aside for later. Add the finely chopped onions and sauté on medium flame till they turn golden brown. Add ginger-garlic paste and minced green chillies. Fry till the raw smell of the garlic goes away. Add garam masala/ curry powder and cumin powder. Mix in chopped tomatoes and cook for 5 minutes. Add the spinach, soy yogurt, ¼ cup of water and mix them well. Cover with a lid and cook for 5-6 minutes on medium flame. Add salt to taste and let it cook uncovered for another 3-5 minutes. Add tofu pieces and gently mix them so that the spices are evenly coated and let it simmer for 3 minutes before you switch off the flame. Serve with any Indian flat breads like Naan, Paratha or with Basmati Rice. Previous Post: The Bollywood Bash Raises Money for the Armaan Club!